The GYM is located next to Cornerstone Christian Academy (S3655 Duncan Lane) off of Highway 14 and County Road Y between Westby and Viroqua. The GYM (God's Youth Ministry) is the athletic center for Cornerstone Christian Academy and the home of Tri-County Blazers/Flames basketball teams. 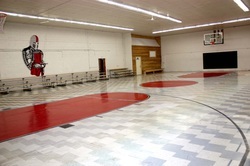 The GYM is available for community use. Contact Dave at 608-632-0964 or cluckers@mwt.net. As you can see, there is a basketball court and bleachers. We also have a locker room, weightlifting room, and a classroom.